To approach a new movie directed by Riley Yip generates interest and excitement. His currently four movie long filmography as a director comes to an end here for me after I began my journey with Metade Fumaca, a movie that isn't the first but a very good introduction to his work. He's a hard one to define but there lies no doubt that Yip Kam Hung is a great director, a more audience challenging one though. An apparent style is hard to pin down but themes that do turn up in each one of his films are love and memories. The best directors make you remember the small, maybe not crucial, touches and Riley's films does have that plus another thing worth mentioning; terrific music. Riley haven't diverted from the drama genre yet but diving into the world of Just One Look didn't feel like repetition since drama is a genre you can do a LOT with. Cast in leading roles are pop stars Gillian Chung & Charlene Choi, also known as The Twins and after making passable turns in Joe Ma's Summer Breeze Of Love, they're now in a much different filmmakers hands. Just One Look plays out as a slice out of a few youths lives that may not be exciting but what it will do is take some of you back, either to your early 70s childhood or to your childhood regardless of era. In this movie our characters are experiencing and enjoying the martial arts movie boom by watching hordes of Shaw Brother's movies. In the village life that they live there resides not many future dreams but the big screen took you places and for some young men the practicing of martial arts was a given hobby to take on. Fan (Shawn Yue from The New Option) and Ming (Wong You Man from The Mummy, Aged 19) aren't big dreamers and go about their lives in an ordinary fashion. In your younger years you don't plan out everything in great detail and these two kids devote their time when something worth devoting your time turns up, namely love. After a while it felt like this Riley Yip-penned script may not actually fully end the story of these kids. It is an early episode, albeit it an important one, of their lives but Yip could've choosen any section of their lives to tell really. However at this point the kids still possess that youthful innocence and that makes it a more interesting tale to tell. They and others are realistic characters and Riley even makes us think something about one or two of them when in reality they are not what we expect. That's called being judgmental but in Fan's case it may be valid. He's convinced that Crazy murdered his father over a debt and that is one of the plot devices outside of the romance. All in all they are humans and while you can write those it isn't entirely impossible that they're based on what Riley saw himself growing up. Who knows, this may be more of a autobiographical movie. Yip still touches upon the theme of love but not like what we've seen in previous films of his. Our main character Fan we follow first as a young boy experiencing death in the family and then Just One Look stays in early 70s for the remainder of the piece. Riley again takes his time to develop the, actually, little he has to tell. In Love Is Not A Game, But A Joke his patience became a bit of a problem for the audience but no such problems in this his 4th film. If you by any chance do not find the first 30 minutes interesting, at least it's a pretty movie to look at. The nature and village life (which I guess is filmed up at the New Territories) looks beautiful on camera but helping that along is also the art direction by Hai Chung Man and Pater Wong. Even when Gillian and Charlene enter the story Riley still paces everything calmly, just like the environment is, so it's up to the audience if they want to settle down and take it easy as well. I was never bored and there was always something worth noting or admire in most scenes ranging from photography to design (Martial arts fans are going to enjoy this for the various movie posters seen throughout the film). What Riley has dumped with this film is the higher level of sentimentality because this isn't a sad story. The tone is more soothing, relaxed and pleasant. As always with reviews of Riley's films you have to mention music. It's a much more restrained score this time around and composer Henry Lai mostly relies on simple guitar pieces. They work wonderfully well for sweet the atmosphere that Just One Look possesses. An ending in a Riley Yip film can cause trouble for some viewers when it's often saying much without saying much. The final outcome I had no problems with but I would like to know his thoughts for creating the almost fantasy like martial arts duel towards the end. We've seen genuine fantasy sequences earlier (which again film fans will enjoy) but here when the fantasy becomes reality you start to question the logic. It works from a story standpoint since it takes us forward and while not destroying the movie, I'm unsure if this was an appropriate choice. Despite bigger names in the cast, Riley lets a quartet of young actors (and popstars) carry the film and he's churned out good performances from them all. Shawn Yue is a capable leading man with an uncanny resemblance to the Nic Tse we saw in Metade Fumaca and Wong You Man, as the best friend, never becomes irritating but rather nicely embodying the young man he's playing. Gillian Chung and Charlene Choi feels like they're directed just like the movie itself; calm and sweet. Of course me seeing them for the first time as actors and not as pop stars helped making that image distanced but the direction of them should make any fan forget, for the moment, about their other career in entertainment. 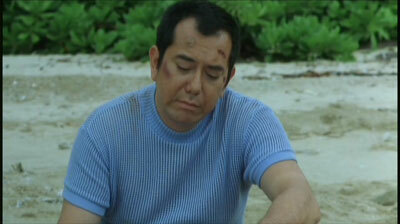 Out of the three Anthony Wong nominated performances of 2002, this one I thought he should've one for. At first his Crazy character isn't any more than the village thug but there's more humanity to him as we find out later. Anthony brings experience and enough commitment to make this character justice. Truly great? No, but the appropriate actor in the role is more correct to say. Eric Kot and Sam Lee also turns up and the surprise cameo by the end makes that performer's third appearance in a Riley Yip movie. Drama is still an acquired taste for the Hong Kong cinema fan but out of all Riley Yip's movies, this is the most accessible but less deep. The latter shouldn't be seen as negative in any way because it's a conscious choice for this movie. It's all very simple and pleasant to follow and The Twins doesn't automatically make Riley a commercial filmmaker. Being a recent movie I had hopes for 16:9 enhanced transfer from Universe. We sadly didn't get that but the 1.85:1 image looks good anyway. No print damage is present and while it could've been slightly sharper, it's another quality transfer of a Riley Yip film. Audio options are Cantonese Dolby Digital 5.1 and 2.0 Mandarin dub. Being a rather quiet film where dialogue matters the most, Universe doesn't disappoint. It's clear sounding and whenever music kicks in (like The Twins song Melody Fair) the front stage gets a nice workout. The English subtitles are optional and feature no errors as far as I could see. Everything said was made understandable in the translation and, as I've mentioned before, recent bigger Hong Kong movies have better subtitling jobs. Traditional and simplified Chinese subtitles are also included. Extras consists of Star's Files for The Twins, Shawn Yue and Wong You Man and for once director Riley Yip. Since none of these people have extensive careers currently, there's not much to write. Riley's file have no mention of his first movie though which was a sloppy errror by Universe. Also included are trailers for Just One Look, If U Care..., My Wife Is 18 and 2 music videos. One is for The Twin's version of Bee Gees Melody Fair and the second one a Chinese language song by The Twins. Both are set to clips from the film and are more like additional trailers than music videos.